The Regional Development Australia Fund (RDAF) allocations via Round 5 have been announced. Interestingly this was not announced at the Regional Development Australia Conference which was held over the 15-16 June weekend but almost immediately after on the last day of the Australian Local Government Association National General Assembly. There is another series of RDAF funding via Round 5B which will allocate a further $200-million in funding available until 30 June 2018 (for which I’ll complete a separate round of analytics). On Wednesday 19 June 2013 the Minister for Regional Development and Local Government, the Hon Anthony Albanese MP, announced that applications for Round Five of the Regional Development Australia Fund (RDAF) open on Friday 21 June 2013. RDAF Round Five is an allocative funding round, with each local government that was funded under the General Purpose component of the Financial Assistance Grants 2012–2013 eligible to apply for funding for infrastructure projects. RDAF Round Five will provide $150 million to eligible local governments, according to an allocative model, for capital infrastructure projects. $105 million of the funding will be allocated to regional local governments while $45 million will be allocated to urban local governments. The funding for regional local governments will come from the Regional Development Australia Fund and funding for urban local governments will come from the Liveable Cities program. Eligible local governments are those that received the General Purpose component of the local government Financial Assistance Grants in 2012–13. Effectively this means that all 565 Local Government Area’s within Australia will get funding which totals to $149,999,994. The LGA funding details can be found at on the DoRALGAS site. Given the extensive detail of this it will be quite a challenge to do the analytics. Here is a look at the funding commencing with a breakdown by State and I’ll add more graphics and detail as I populate the data. This chart looks at three items. The inner ring is a split between funding to capital and non-capital cities. To be clear all the State plus the territorial capitals (Darwin, Canberra and Kingston) are included. Metropolis: Any city with a significant urban area greater than 500,000. The outer ring is split between funding that I have been able to populate (data verify to council chamber level) and work still ‘in progress’. Currently I have been able to populate 75% (112.5-million) of the funding with 52% of the councils (294 out of 565). At this time I am in the process of working through those councils that received between $200,000 and $300,000 of funding. The second chart looks at funding by State and is fully updated. Note: This infographic was created using Tableau Public. 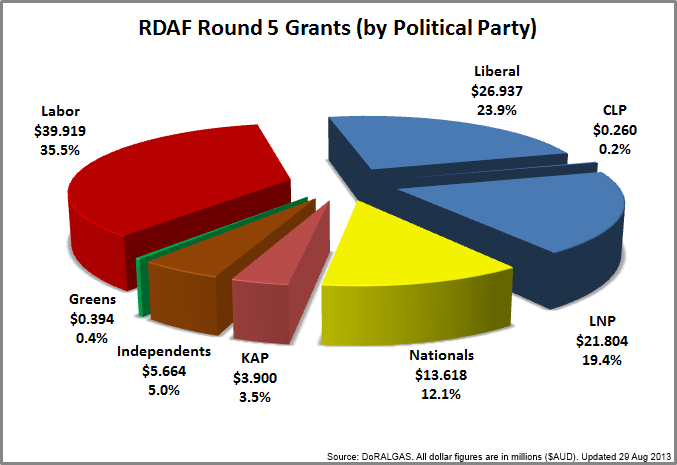 This chart looks at funding by political and is not fully updated (see RDAF Round 5 Funding by Data Population & Population Centre). To populate the entire chart from the outset I specifically selected a seat held by an Independent, the Greens and Katter’s Australia Party (KAP). On the conservative side (in blue) the slices are split into the Liberal Party, the Liberal National Party (QLD) and the Country Liberal Party (NT). The National Party section (in yellow) also includes funding that was allocated to O’Connor, which is held by Tony Crook of the WA National Party. 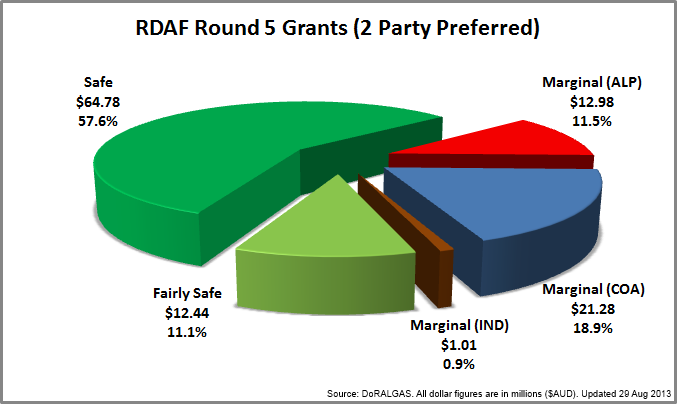 The next chart looks at funding by how safe the seat is considered. The Australian Electoral Commission states that Divisions with a 2-party preferred (2PP) percentile of 60% or greater are safe, those between 56 – 60% are fairly safe and those between 50 – 56% are marginal. Where a seat is considered marginal (based on 2010 election results) I have split into Labor, Coalition and Independent. I’ll continue to update this article as I populate the data down to LGA level. Declaration of Interest: I have utilised only publically sourced information and all analysis and views expressed are my own and do not reflect that of any employer or organisation that I am associated with. Random Analytics: TIRF Funding Analysis (Round 1). Added Funding by Population Centre, Funding by Political Party & Funding by 2PP sections with inclusion of 20% of the funding data populated. Updated Funding by Population Centre, Funding by Political Party & Funding by 2PP sections with 40% of the data populated. Updated Funding by Population Centre, Funding by Political Party & Funding by 2PP sections with 50% of the funding data populated. Additionally added a link to RDAF Round 5B. Updated Funding by Population Centre, Funding by Political Party & Funding by 2PP sections with 65% of the funding data populated. Updated Funding by Population Centre, Funding by Political Party & Funding by 2PP sections with 75% of the funding data populated. 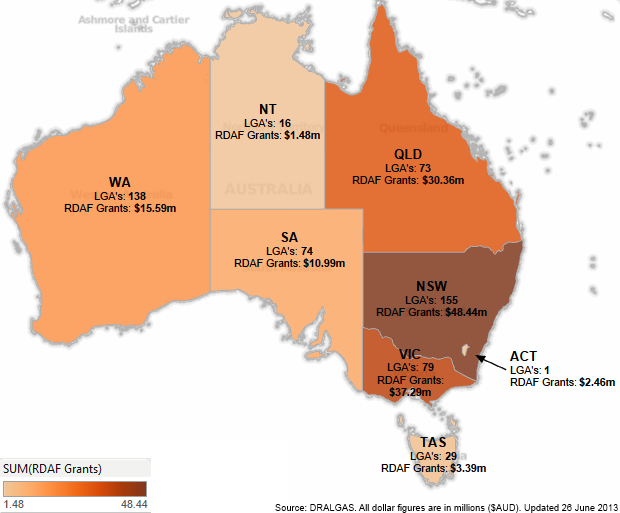 Why is it that RDAF, with R being Regional, has such a large percentage of funds going to metropolitan regions? I know this has been publicly before, but I know the some areas in WA which received Round 4 funding are definitely in the metropolitan area. It is a very good point you make. Regional funding should go to regional areas. I cannot speak on behalf of the Department but having completed more than half of the analytics on RDAF Round 5 I will make this one observation. 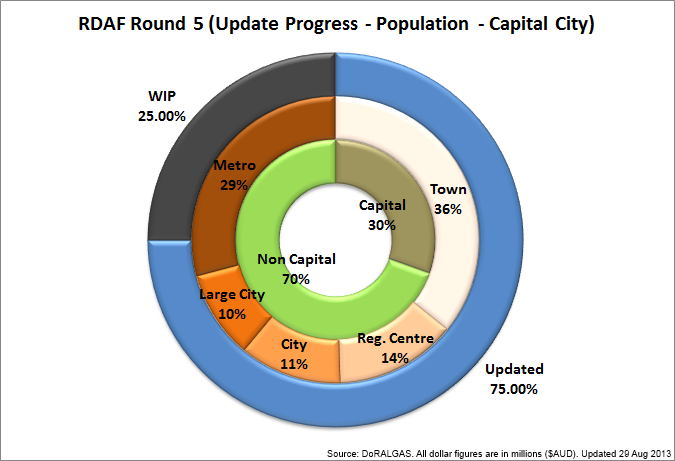 RDAF Round 5 was an allocative round, that is, the Government of the day decided to allocate the $150-million worth of funding to all of the 565 local government areas, including large amounts of funding to metropolitan LGA’s in our biggest cities (as an example Brisbane City Council received slightly more than $2-million). Thanks for the reply. Round 4 which was not allocative and had a similar amount going to the metropolitan areas. $10M went to the metropolitan council to help build a facility for the Fremantle Dockers football club. I’m sure the players for the Dockers would be interested in hearing that they will be training in a facility in a “regional” area! BTW Go Dockers! Hmmm it was around the time when the local Labor member was looking very shaking in maintaining her seat. I’m too cynical! You might be interested in reviewing the analytics for RDAF Round 4, which are still ‘Work-In-Progress’ as all the announcements are not yet finalised.